What's better than reading a good book? Discussing one! Everyone here at Stellar Four loves to read and we wanted to get you guys in on the action. Every month, we're going to pick a sci-fi or fantasy novel to read and discuss together. 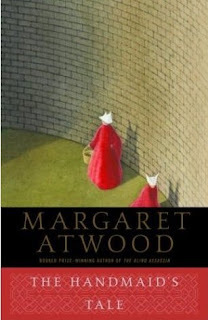 For our inaugural bookclub discussion, we've chosen Margaret Atwood's The Handmaid's Tale. The story follows Offred as she navigates through a brutal new dystopian world where women are property. The award winning book shows a stark, oftentimes horrific view of what life could be like with all the rights women fought so hard to obtain stripped away. A staple of dystopian science fiction, this novel is a classic with startling and timely parallels to our own current society. We hope you'll join us on September 15th, when we open discussions for The Handmaid's Tale! You have a whole month to get reading! Visit your local bookstore, grab a copy on eBay or find one at your local library! We can't wait to get started! This was our "common text" for my college English program my freshman year. That meant all the intro classes read it. There was a controversy, since it is a Catholic college, because some thought it criticized the Church. It's a really thought provoking book, though I found it a little dry. This I want in on i've always wanted in a book group that wasn't contemporary.